Full of mice! That's great. I think I know that one, believing someone's full of wisdom when they're only full of "mice." Happy Tuesday, BB! What a absolutely beautiful picture of the Owl. We enjoyed the poem too. Have you read the book "Wesley the Owl", by Stacy O'Brien? It about a lady who recues and rehabs a baby owl and their life together. Very very good. I know a few people who like to think they are wise when really they are full of . . . . mice. Oh, that's a wonderful poem. Put a smile on my face. Thanks. Wonderful verse, I had my photo taken with an owl whilst living in Spain. Good verse, I listened to 3 trying to get a hoot from a female on Easter. A beautiful photo and a funny verse. Thanks for the chuckle on this Tuesday. Funny. I love owls. They do look wise, but I bet they're just full of gas. I will never look at an owl the same way again! Thank goodness it's only mice (I always get a little nervous when I let my dog out as we have one who likes to hang out in our backyard.). That poem is such a hoot! What a great picture! Your posts are always so interesting. Oh, Betty... I feel like you posted this one just for me! Thanks! That truly made me giggle! So true...owls are such handsome birds (maybe it's their diet)! Heh, heh. I liked that poem very much. I have heard but never seen a wild owl. We have 'em... they just don't show themselves. I like the ending about being full of mice or is this a play on words meaning men are only full of mice hmmmm I need to think about this. I have a soft spot in my heart for owls since reading Harry Potter. I often hear a great barn owl in the pine barrens behind me during the summers. Ha! That was cute. 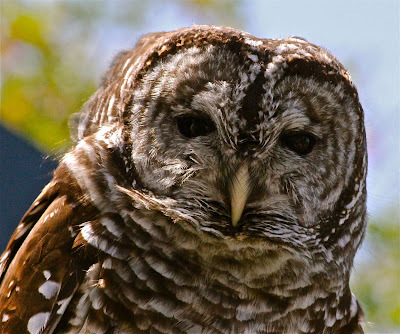 I love owls...well, except when they park themselves right outside my bedroom window and hoot all night! Nice poem! That's someone who didn't like owls much huh? I think they look awsome. That poem's cute. I like it. And I've never seen an owl so brown and white. Interesting. You know, other than in a zoo, I've never seen a real, live owl. Sheltered, I tell you. Sheltered. I LOVE the owl picture. Now, for you, my friend, a story. Me: "Did you see that?" Dear Daughter: "It was a hawk!" Me: "Did you see what he had?" DD: "Yup. A mouse. Rest in peace, Little Buddy." At first, I chuckled. And then, I got to thinking about the carnage that was going on up in the tree top just above me, and I got a little queasy. Had to change the subject in my own mind!!! Love the poem, it's so clever. I'll have to share it with my youngest, she loves owls! Betty, this is awesome! So were you lying in bed one night unable to sleep, and you just whipped this little ditty out? It's fantastic! Owls are interesting little things. I don't know if I like the or are scared by them. Just blogging around and found your blog. Okay cute poem, you got me, it made me smile. Thanks for letting me visit and lightning up my evening. Huh, stuck me by truth with that poem line "We think him full of wisdom when he's only full of mice" made me smile though. I love owls specially its delicate feather and cute heart-shaped face, cudly. I LOVE both the poem and the photo! I'm gonna going to check out Mr. Kennedy out for more.